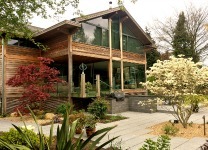 To create a practical garden that would integrate with the open plan modern house design, accentuate the countryside views and provide special areas for entertaining, relaxing and sport. 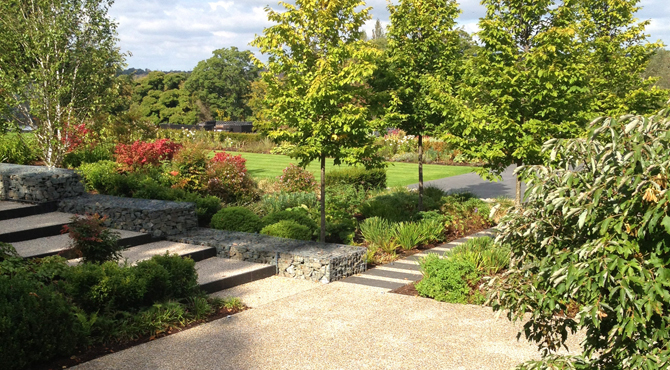 Around the house and Flint Courtyard, extensive areas of paving, decking and resin bonded pathways are complemented by both structural and softer perennial planting and lawns. 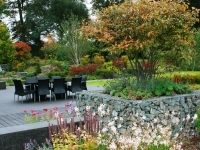 Gabion walling is used to retain new banks and create planters. Thousands of plants were carefully selected and planted to transform this space. Part of the formal planting near the terrace is created from clipped topiary cubes of varying heights, punctuated with carpet planting of Lavender, Salvia, Nepeta and clouds of white and silver plants including Astelia and Gaura. Away from the house meandering areas of mown grass border vast areas of wild flowers and bulbs, a Cherry orchard and woodland fringe planting creating natural routes around the garden.